Mixing various schools of design can really bring a number of spaces to life, from the living room or bedrooms to a house's kitchen. But it can be hard to imagine such a mash-up of style in the bathroom. Bathrooms, for one, tend to be smaller than most other spaces. Most style mixing might end up leaving your space feeling too busy or overwhelmed. But there's one pairing that's so good in a bathroom, you'd expect it was designed specifically for your space - the modern Victorian. Although you'll find styling like this easier when you start with Victorian accents, it's not difficult to add some of these to a modern home. But if you're living in an older house, consider some of these suggestions as to what to keep and what to add. It's sure to kick out all the stuffy and bring in a solid dose of the stylish and new. First and foremost, hold onto your wainscoting. One of wainscoting's original purposes was to conceal leaks or water damage in the walls from early plumbing, which is why it's often so prevalent in the bathroom. But luckily, it also looks good and happens to be about as iconically Victorian as an interior designer could ask for! You'll also want to hang onto your tub, and, depending on your taste, any Victorian-style mirrors or frames you have in your bathroom. If you have Victorian-style light fixtures - sconces, a chandelier - keep those too. Meanwhile, tear down all wallpaper and drapery and consider redoing your vanity and sink. The first thing you'll want to do is inject a little color into your space. Paint your wainscoting and the wall above a pair of complementing hues. While you can go with a deep brown or leave the earthy wood hue of the wainscoting as it is, choosing something lighter or brighter will go a long way toward accentuating the modern design in your new bathroom. Avoid the busy look of wallpaper at all cost, instead focusing on clean, vibrant colors. You may even want to paint your tub! If your toilet is in need of a replacement, now's a great time to do it. Rather than something on par with Victorian water waste, why not go with an eco-friendly option? 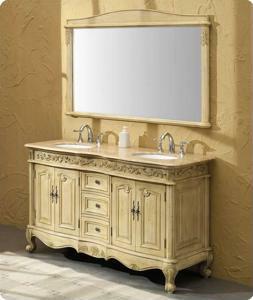 You'll almost certainly want to have a new bathroom vanity installed as well!